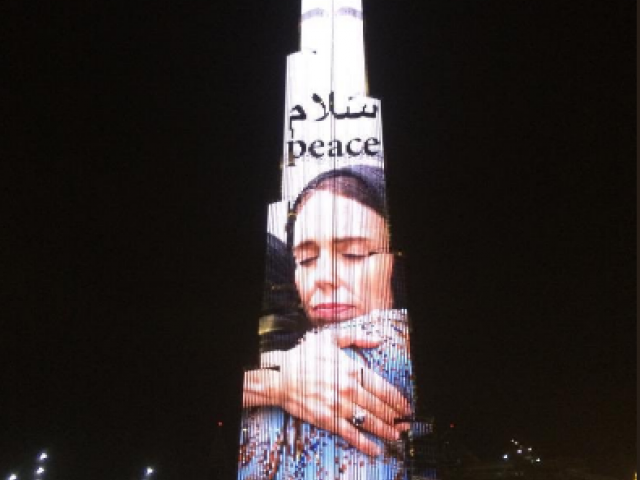 Burj Kahlifa, the world’s tallest building, on Friday lit up with New Zealand Prime Minister Jacinda Ardern’s picture to pay tribute to the victims of Christchurch mosque attack. UAE Vice President, Prime Minister and Ruler of Dubai Sheikh Mohammed bin Rashid Al Maktoum in a tweet thanked the New Zealand’s premier saying her sincere empathy and support for the mosque attack’s martyrs has earned her the respect of 1.5 billion Muslims worldwide. On 15 March, 28-year-old Australian gunman Brenton Tarrant armed with semi-automatic weapons rampaged through two mosques in the quiet city of Christchurch during Friday prayer which claimed at least 50 lives and dozens sustained injuries. Nine Pakistani national, including Naeem Rashid who received bullet wounds while trying to overpower the white supremacist shooter, lost their lives in the terror attack.